Hhhmmmm soup… A favourite of mine during the cold Winter months. Added bonus is you cook up a big pot of soup, divide into smaller Tupperware containers and you have a meal readily available whenever you’re just not in the mood to cook something. This recipe is easy-peasy and can be adjusted to be as thick or spicy as you want. Neal has a little baby mouth, so I hardly ever put spicy / hot seasoning in our food. Feel free, though, to adjust quantities as you wish! Add oil to a big pot and cook the bag of Woolies fresh chunky vegetables over a medium heat for about 3 minutes, stirring occasionally. Add the 2 litres of vegetable stock to the veggies and bring to the boil. Add the chopped butternut (remember the bigger the butternut chunks, the longer the soup will take). Add the sugar (sugar brings out the flavour of certain savoury dishes). Cook on low-medium heat until all the vegetables are soft – not al dente. I like to make sure the veggies are properly cooked and squishy (yes, I said squishy), so this usually takes about 45 minutes. Blend your soup with a hand blender (that’s what I do) or in a proper blender (remember to check if your blender is able to blend hot liquids should it be a plastic blender). I like my butternut soup to be very smooth, so I blend blend blend. Once you are happy with the consistency, add the cinnamon and low fat Greek yogurt (this is just to add a bit of healthy creaminess to the soup). Now it’s time for the taste test. I always wait until my soup has been blended and I have added all the other spices / seasonings before adding salt, since the vegetable stock is usually already salted and the Greek yogurt can tone down the saltiness of the soup. At this stage the soup will probably need a little bit of salt, so add as much as you like. Same with pepper, make it as mild or spicy as you want. And there you have it, yummy homemade butternut soup – enough to share with friends and family (or to keep in the freezer for lazy days). Thanks, Lauren 🙂 The heart bowl is from Kamersvol Geskenke, they have an online shop but unfortunately those bowls are sold out… 🙁 I love my little ‘2 Peas in a Pod’ shakers! Let me know how it went! Better yet…if you have Instagram, take a photo and tag me in it! …atleast I now have some Clarins products, thanks to your previous post. The good comes with some bad I guess. Oh no! Get some nice Yankee candles and keep them burning for a couple of hours at a time, that should help for the smell! At least now you have more Clarins products – yay! Delicious!! I was fortunate to taste it and now have the recipe, thanks! 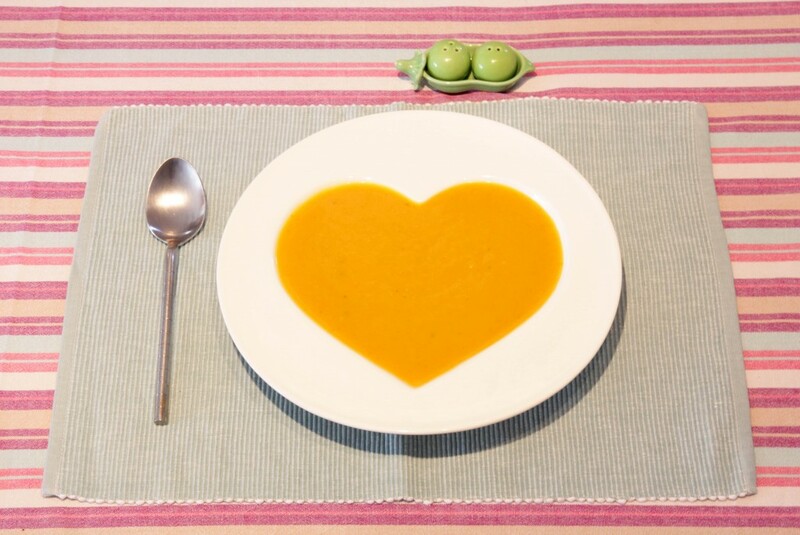 Love the heart bowl, since the soup is made ‘from the heart’!! This looks delicious. I sometimes add a little curry powder to my butternut soup for a change – it gives it a little bite!